A biliopancreatic diversion changes the normal process of digestion by making the stomach smaller and allowing food to bypass part of the small intestine so that you absorb fewer calories. You will feel full more quickly than when your stomach was its original size, which reduces the amount of food you eat and thus the calories consumed. Bypassing part of the intestine also means that you will absorb fewer calories. This leads to weight loss. There are two biliopancreatic diversion surgeries: a biliopancreatic diversion and a biliopancreatic diversion with duodenal switch. In a biliopancreatic diversion, a portion of the stomach is removed. 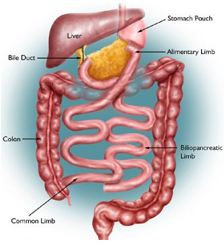 The remaining portion of the stomach is connected to the lower portion of the small intestine. In a biliopancreatic diversion with duodenal switch, a smaller portion of the stomach is removed, but the remaining stomach remains attached to the duodenum (the upper part of the small intestine). The duodenum is connected to the lower part of the small intestine. These procedures can be done by making a large incision in the abdomen (an open procedure) or by making a small incision and using small instruments and a camera to guide the surgery (laparoscopic approach). Surgery for obesity usually involves a 4- to 6-day hospital stay (2 to 3 days for a laparoscopic approach). Most people can return to their normal activities within 3 to 5 weeks. A biliopancreatic diversion may cause dumping syndrome. This occurs when food moves too quickly through the stomach and intestines. It causes nausea, weakness, sweating, faintness, and possibly diarrhea soon after eating. These symptoms are made worse by eating highly refined, high-calorie foods (like sweets). In some cases you may become so weak that you have to lie down until the symptoms pass. Dumping syndrome does not occur in a biliopancreatic diversion with duodenal switch. Biliopancreatic diversion surgeries result in reduced absorption of protein, fat, calcium, iron, and vitamins B12, A, D, E, and K. You may have frequent, bad-smelling stools and a higher risk for developing osteoporosis. 30 out of 100 people develop anemia. 30 to 50 people out of 100 develop a deficiency in vitamins A, D, E, K, and beta-carotene. About 4 people out of 100 need hospitalization because of lack of protein. Protein deficiency is somewhat less of a risk in the biliopancreatic diversion with duodenal switch. Requires removal of Gall bladder because of high incidence of stone formation.